Grow Your Natural Health Business No Matter How Tough The Economy Is! 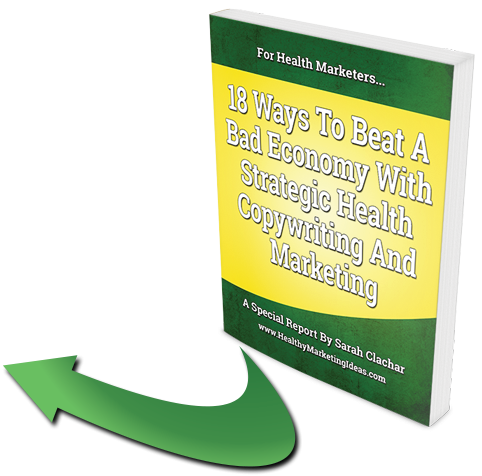 Put these 18 strategic health copywriting and marketing tactics to work. Just fill in the boxes below and I’ll send a copy to your inbox pronto. Can’t Refuse . . .
Sarah is a very smart, detail oriented writer and marketer. She cares about her clients and goes the extra mile to provide great work from concept to completion. Her nutrition knowledge is particularly helpful. Combine that with her SEO writing skills … and her ability to work well with a team and you have a healthy marketing powerhouse. Some writers have the ability to absorb a large amount of complex information and then write on that topic with amazing clarity. Other writers have a talent for writing strong, persuasive sales copy. Sarah is one of a very small group of writers who can do both. It ain’t easy out there . . . The natural health marketplace is competitive and tough! You need someone who can help you grab your prospect’s attention, glue it to the solution you offer and make it seem just about unreasonable to step away from it. As a natural health company, you’re facing an increasingly skeptical and well-informed market. You have to work hard to build trust. Your market is tighter with their purse strings. Each marketing touch has to convince your prospects that your product is worth the price. You need a copywriter and marketer who understands the natural health marketplace. Someone who can bring to your marketing . . .
√ Powerful writing skills that make it easy for your prospects to move through your sales funnel. A professional writer for over 15 years, I know how to wield the power of the pen (or keyboard)! √ Persuasion tools of the copywriting trade honed from lots of practice, experience and watching what’s working around me. I tap into the copywriting techniques that have stood the test of time as well as keep an eye on new approaches that show promise. √ Technical knowledge – The best copy comes from a thorough understanding of the fine points of your product and how it interacts with human biology. My BA in Biology and health educator background come in handy as I pore over published scientific journal articles on PubMed, interview experts and delve into your product’s qualities. √ Empathy. Perhaps more important than knowing the science is knowing who I’m writing to. I spend many hours poring over testimonials, lurking on forums and even calling your prospects up on the phone to get a clearer sense of what people are aching to fix in their lives. √ Some Saleslady Savvy. Knowing how to write copy without an understanding of the larger marketing picture is like knowing how to kick a soccer ball without understanding anything about the game of soccer. Sure you can kick the ball – but can you get a goal? I bring tactics and strategy into the larger discussion so we can make sure the copy I craft for you will score. When you bring me in to work with your marketing team, you add a whole new dimension to your marketing. But don’t just take my word for it. Here’s what a few of my satisfied clients have to say . . .
Sun Chlorella USA has been active in the direct mail business for over 30 years now and has produced many winning direct mail pieces throughout the last three decades . . . Last winter we enlisted HMI to write a new direct mail piece that included two (test) cover versions. The DM pieces began mailing in May 2013 and so far so good! Both versions have outperformed the control. We mailed in June and the top producing version reached a .9718% result. We hadn’t seen a response like that in many months! Working with you, Sarah, has been rewarding on many levels. You get it. You offer wonderful insights. I look forward to a long-lasting business relationship with you. I worked with Sarah in 2013/2014 when I was Chief Marketing Officer at a top alternative health publisher. Sarah wrote a package for a new product launch of a high-end, anti-aging skin care serum. The copy was very strong and outperformed another version in an A/B split test. In addition, after changing looks and layouts yet keeping the original copy, each version thereafter consistently pulled in record number sales. Sarah is a talented, passionate copywriter that delivers to her target audience and creates a piece that is perfectly suited for them. She understands the entire creative/marketing process and is open to collaborating with the in-house team on brainstorming sessions. I enjoyed working with Sarah and will continue to tap into her skills whenever strong promotional copy is needed for one of my consulting clients. It was immediately apparent that Sarah stood out from the crowd and is an expert copywriter. She guided us through a word-sensitive task that had to comply to strict FDA guidelines. She pulled our resources together and created a solid theme and marketing strategy to help launch our new product. I highly recommend Sarah without hesitation and will continue to use her services. And from a B2B perspective . . .
We were in a jam. A Singapore distributor was interested in moving our products, but needed some more information to clinch the deal. I approached Sarah and she suggested a white paper, walking me through the process. The white paper Sarah wrote for us did a beautiful job of positioning us in the marketplace. It was accessible, well-written with solid research behind it. It helped us finalize the Singapore deal and we have used it tosupport other accounts in Turkey, Asia and Greece. These business deals have helped our family business grow – even in this recession. I highly recommend Sarah to other businesses looking for an excellent sales writer who understands the natural products industry. Sarah’s first rate writing reflects her experience and knowledge working in the natural health industry. She can always be counted to deliver a polished piece of writing that for our company generates industry awareness of our products and ultimately contributes to increased sales. Our company believes in educating our clients so that they can make an informed purchase decision and this was made possible through the two white paper reports professionally crafted by Sarah. Our website wasn’t working for us. We had visitors coming in but very few were contacting our sales team. Sarah helped us turn this around. She performed a thorough site content audit, rewrote our core pages and created a stellar report, video and autoresponder series. Since implementing the marketing funnel she created, we’ve had a 20% increase in leads. But even more importantly, these leads are already pre-sold on our services helping us with our lead conversion. And we’re even saving our sales team time with some of the pre-qualifying of leads Sarah set up in the lead generation process. Overall, investing in Sarah’s expertise and keen understanding of the nutrition industry has been invaluable for my business. I highly recommend her to any nutrition business seeking to improve their B2B marketing. When you choose my services, you’re taking the first step to crafting an offer your customers can’t refuse . . . an offer built on emotional pull, credibility and distinction. 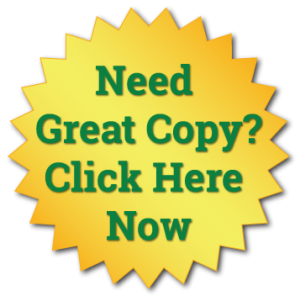 And if you’d like some potent ideas on how to make the most of your internet marketing, get a copy of this free report I cooked up just for you.